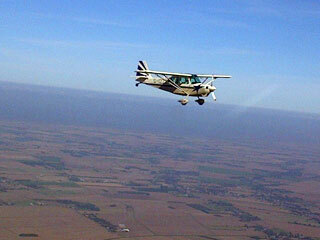 It was a very enjoyable Flying With Diabetes Day 2013 on 12 October, with over 100 attendees at Duxford Imperial War Museum! Talks were given by Douglas, Kyle Rose, Karl Beetson, Gavin Griffiths, Mike Cross, Dr. Frank Waldron-Lynch and Dilan Shah, on subjects ranging from aviation speed records and running 30 marathons in 30 days to climbing Kilimanjaro, plus medical research on treatment for type 1 diabetes, while children's entertainment was given by "Mad Science." A huge "Thank You" to event sponsors Dexcom, Medtronic Diabetes and Sanofi Diabetes for making the event possible, the exhibiting companies and organisations, to all the speakers, and to everyone for attending. We're delighted that the event has raised over £1,500 for the Juvenile Research Diabetes Foundation (www.jdrf.org.uk). It was a real pleasure to hold this event once again, and we look forward to another Flying With Diabetes Day in 2014! 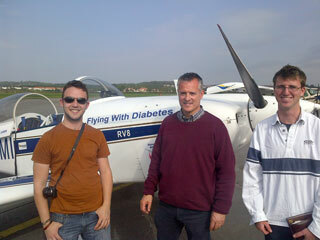 Diabetes Formation Flight Europe is our first international speed record, carried out by Douglas, Karl Beetson and Matt Ponsford in three light aircraft between Beverley, UK, to le Touquet in France (subject to ratification). The flight kicked off directly overhead Beverley in strong easterly winds in "Vic formation" from where it took 2 hours & 22 minutes to cross the English Channel and "break to land" on Le Touquet's runway 14. Clear and sunny conditions prevailed except for cloudy and hazy conditions near Southend and Dover. A huge "thank you" to everyone at Beverley and Le Touquet Air Traffic Control for so much assistance with this landmark international speed record – made possible by recent UK CAA policy for flying with insulin treated diabetes. Completed Diabetes Formation Flight USA 2013 (www.dffusa.org/2013/) today (29th July), setting a new simultaneous world speed record between Omaha and Madison with four single-engine aicraft, subject to ratification by the National Aeronautic Association. A huge thank you to Jackie Vanantwerp and Tim Ryan at Omaha Tower and Omaha Approach, and also Dennis Vincent at Madison Airport for all your help with observing our line-abreast formation overflight of the start & finish. At the start, Douglas, Jason, Taylor, David, Chris just beat heavy coming in from the west of Omaha, and then at Madison we just beat a four-ship formation of F-16 fighter jets to land! Total time was 2 hours, 41 minutes and 54 seconds with the aircraft in "finger-four" formation while in transit between Omaha and Madison." News: Type 1 pilot sets formation flight record. 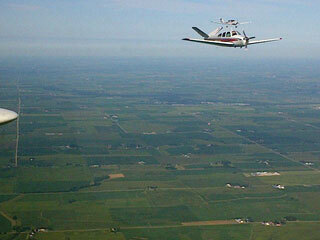 From Jason & Taylor's aircraft; Douglas in lead; Chris on right, David closest. 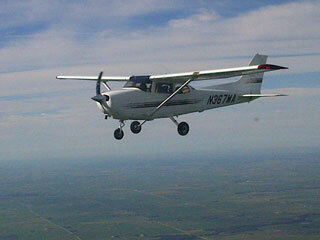 Cessna 172 flown by Chris. Beech Bonanza flown by David and behind is the Diamond DA40 flown by Jason with Taylor on board.